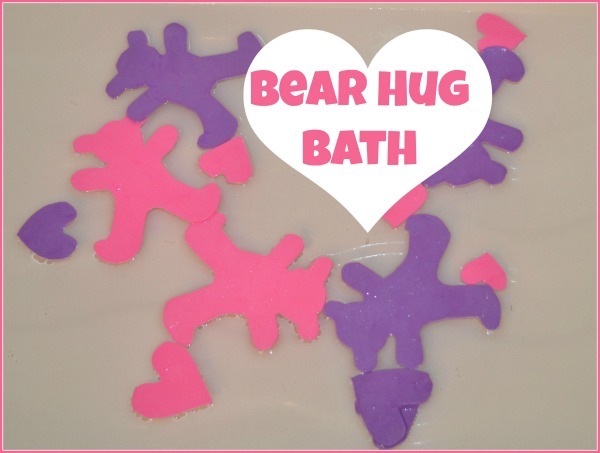 Valentine’s Day Activity: Bear Hug Bath! This week we’re going to be bringing you two Valentine’s Day themed baths. AND each post will have links to other Valentine’s Day inspired baths at other great sites: Growing a Jeweled Rose, In Lieu of Preschool, Living Life Intentionally, and Bath Activities for Kids! Are you excited about Valentine’s Day? My preschooler is! So I surprised the kids with a Bear Hug themed bath over the weekend. 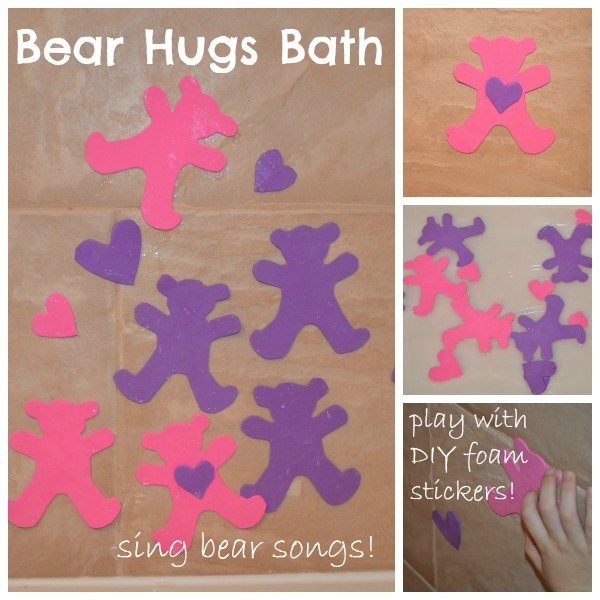 There were pink and purple bear foam stickers, singing bear themed songs, and lots of hugs! To make the teddy bear foam stickers, I first tried to draw the teddy bears. As I looked for some shapes to use as stencils, I saw our bag of cookie cutters. 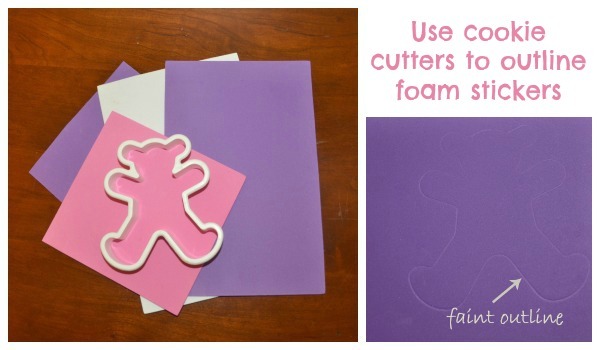 I realized by pressing a cookie cutter down on the foam sheet, it would make an outline in the perfect shape! Once I had the outline, I cut out a bunch of purple, pink, and white bears. Of course, we finished off with some teddy bear hugs! Four other amazing blogs are also doing Valentine’s Day baths – all week long! Check them out – I guarantee you won’t be sorry! Thank you for stopping by! For more play times full of laughter and learning, please join us on Facebook or follow along on Pinterest.